March 8, 2018: Count On Me! 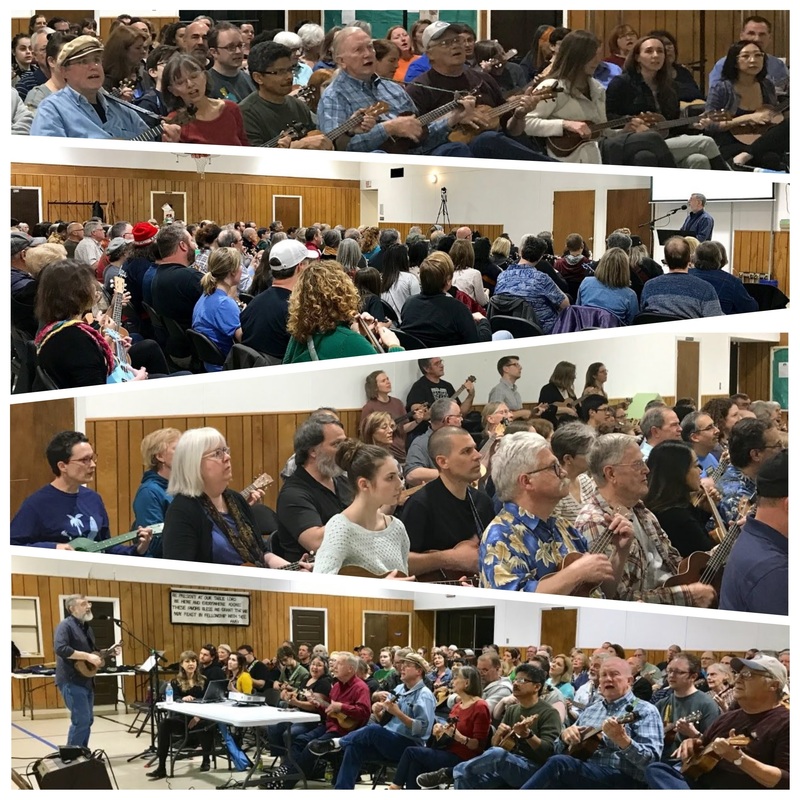 On a lovely springtime evening in central Austin, an enthusiastic group of ukulele players of all ages and abilities met up to strum and sing together. Having learned some classics in recent months, it seemed fitting to focus attention on a hit from the past decade by a very popular and current musician. 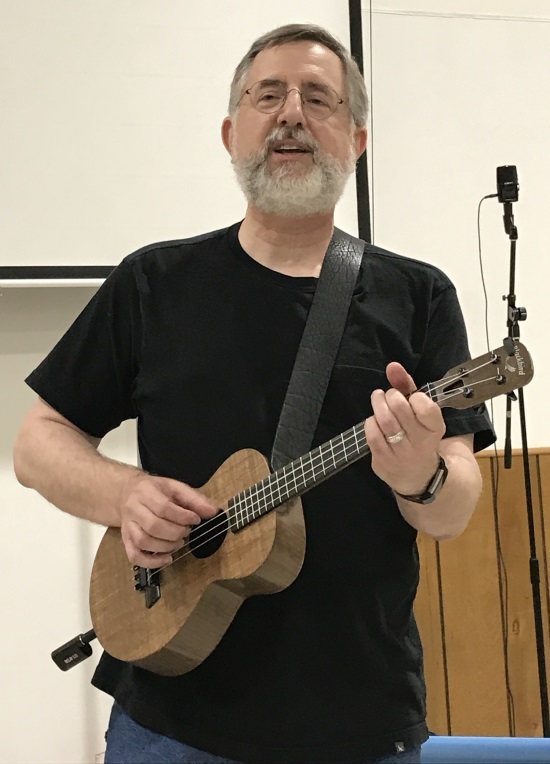 And so Bob put together a great arrangement of “Count on Me” by Hawaiian native, Grammy award winning singer-songwriter (and sometimes ukulele player), Bruno Mars. 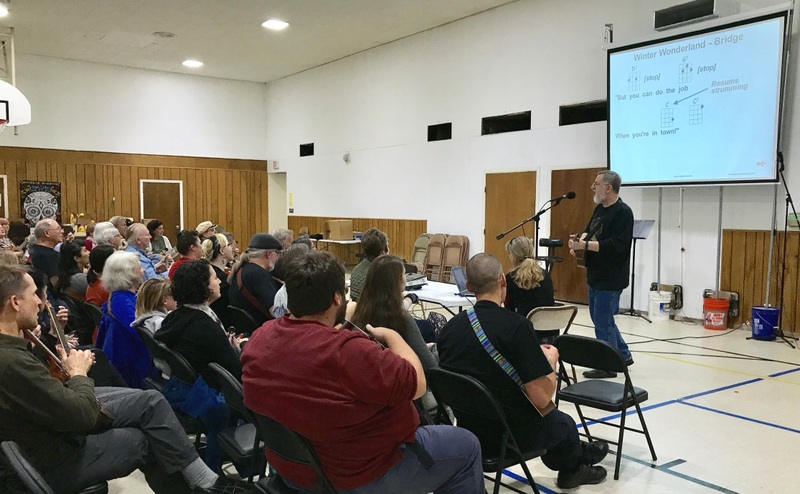 To play along with us, you can download the lyrics and chords for our arrangement of “Count On Me” or download a copy of the presentation and instruction guide (what we project on the screen for all to follow along, including exercises and drills). 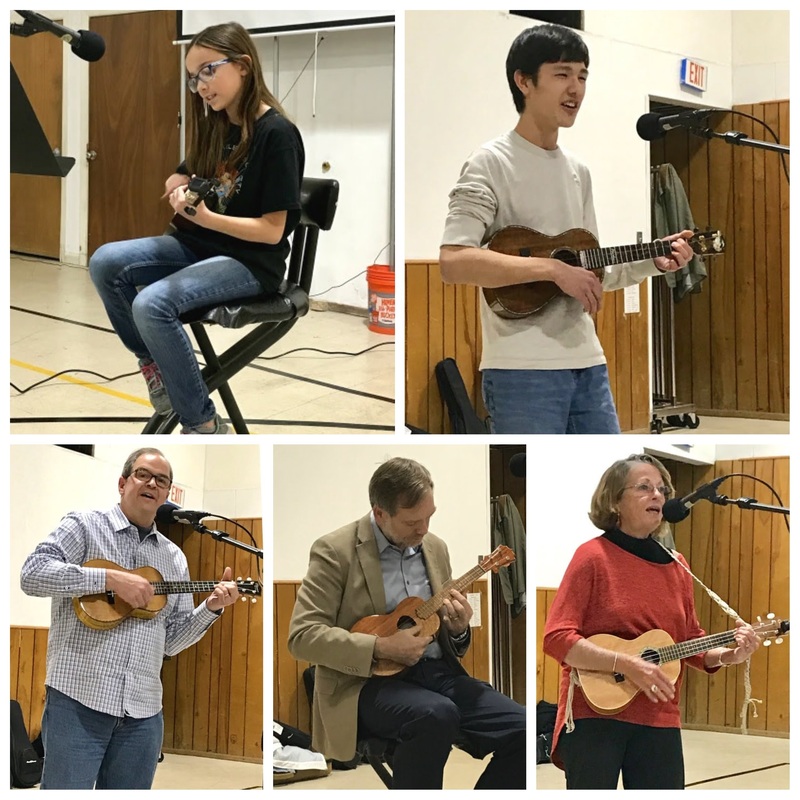 We all enjoyed the open mic portion of the evening, in which we were treated to the talents of some great musicians. 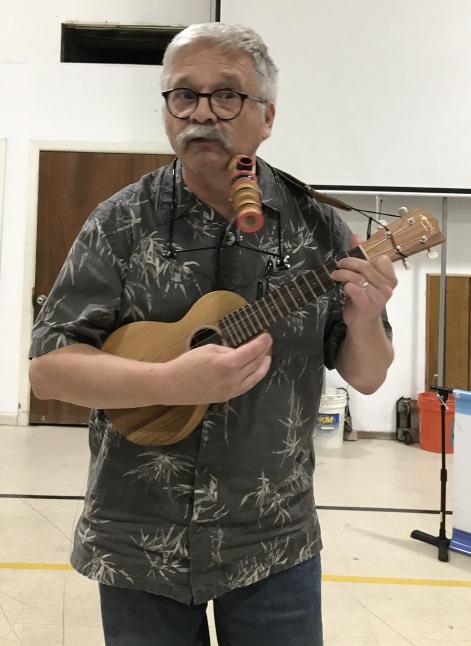 John Lee Boyer, visiting from Iowa, played ukulele and harmonica on a great tune for us. He was followed by The John Davenport on a witty original. 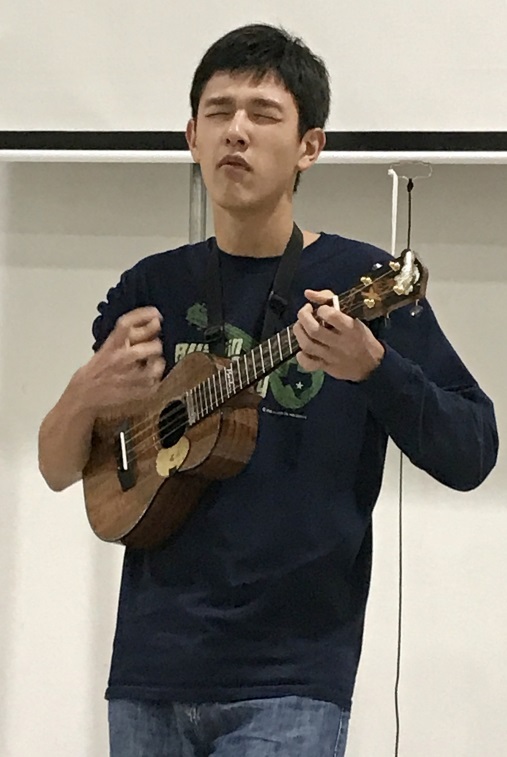 Vincent played a lovely instrumental, and Sho H did a terrific original he’s been working on, while Walter wrapped up the open mic with an entertaining, original song entitled “Red Fez” (accompanied by his kazoo and, of course, his very own red fez). 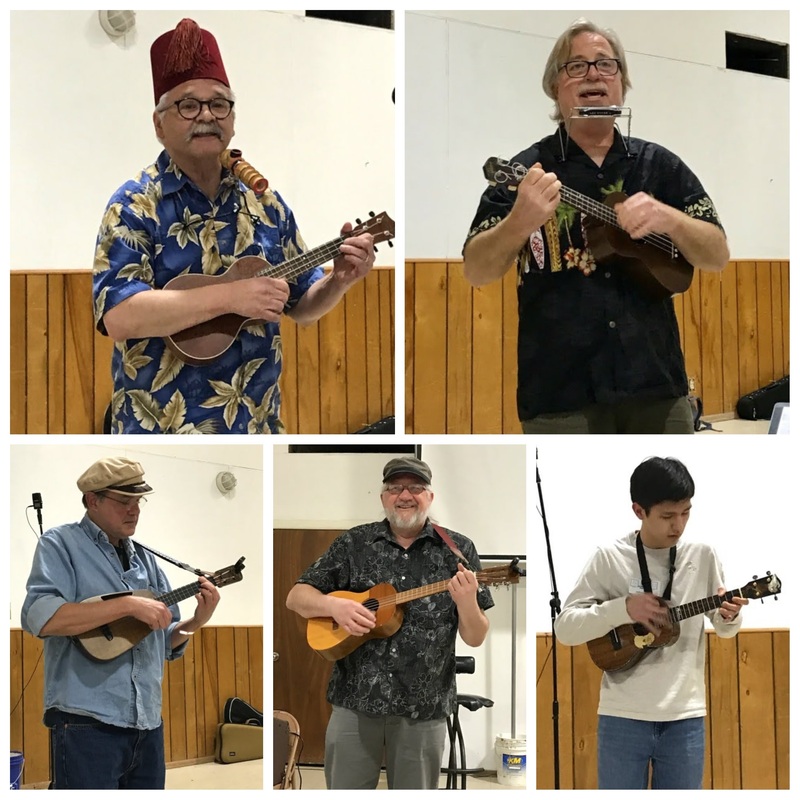 This entry was posted in AUS activities on March 11, 2018 by Austin Ukulele Society. December 14, 2017: Holiday Potluck and Strum-A-Long! 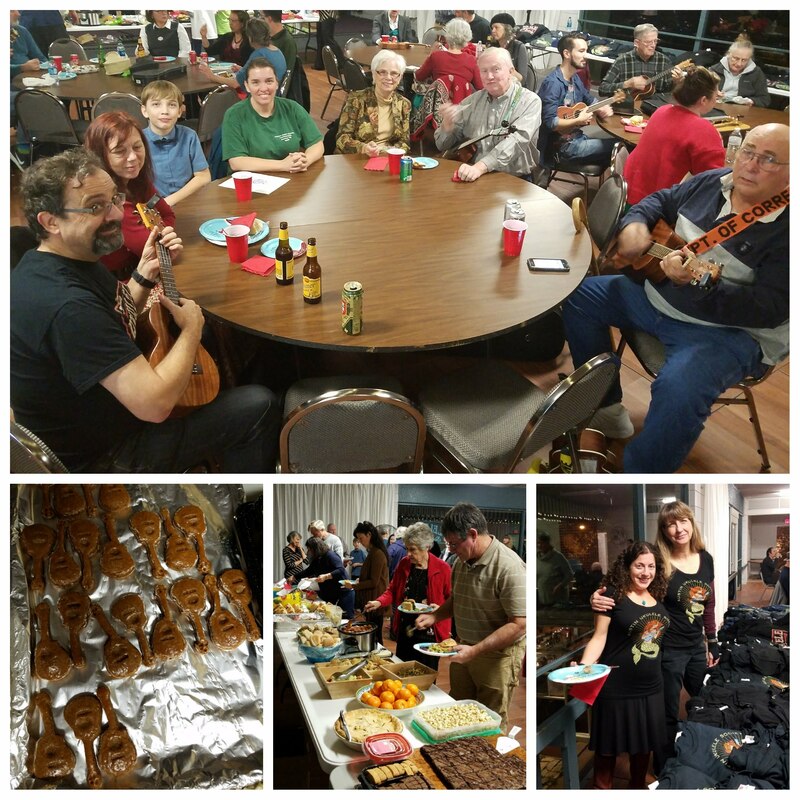 The Austin Ukulele Society was very pleased to host the seventh annual Holiday Potluck and Strum-A-Long! 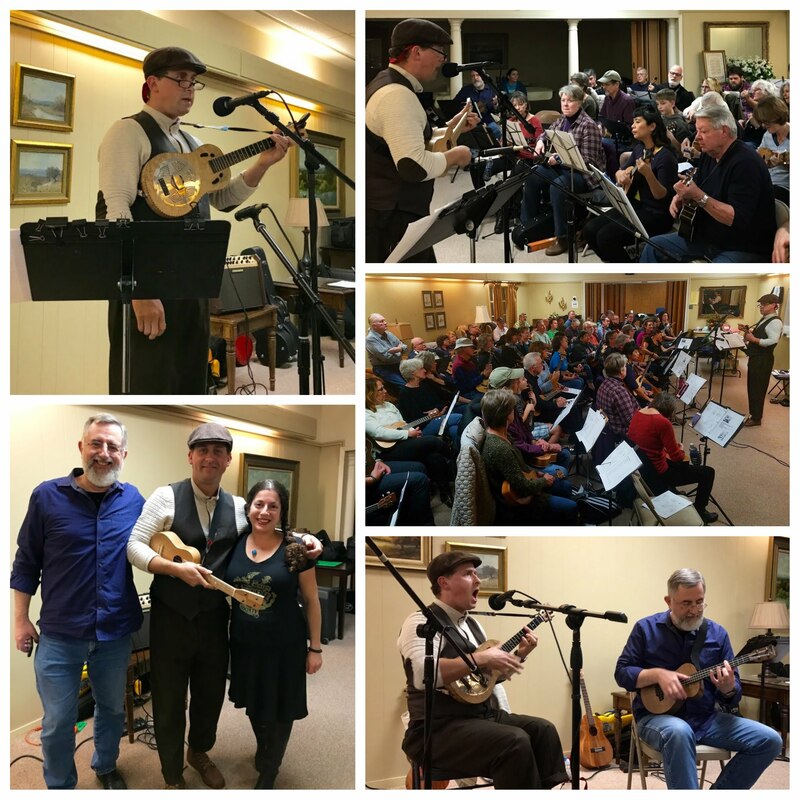 While the regular structure of learning a new song at our other monthly meetings is, of course, a lot fun, we are also grateful to have a chance to break bread and clink glasses in a more social setting for our December get together. Attendees enjoyed lots of food, desserts, drinks and conversation at the High Road on Dawson, as well as a great view of downtown Austin from the deck. 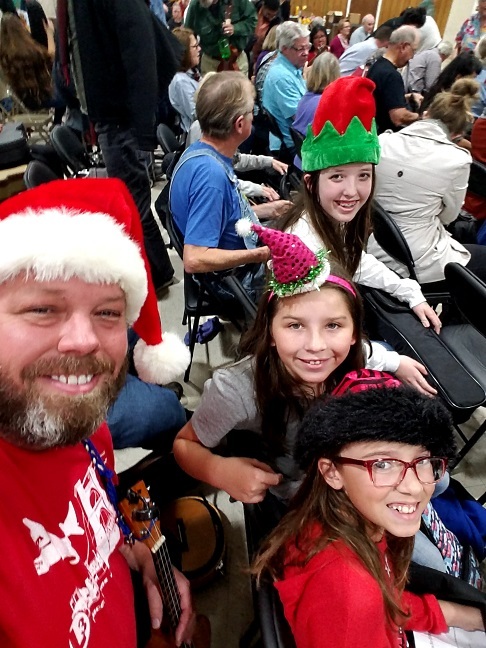 We all felt the holiday spirit, with the chance to strum all of the Christmas-time songs we’ve learned to play over the years. 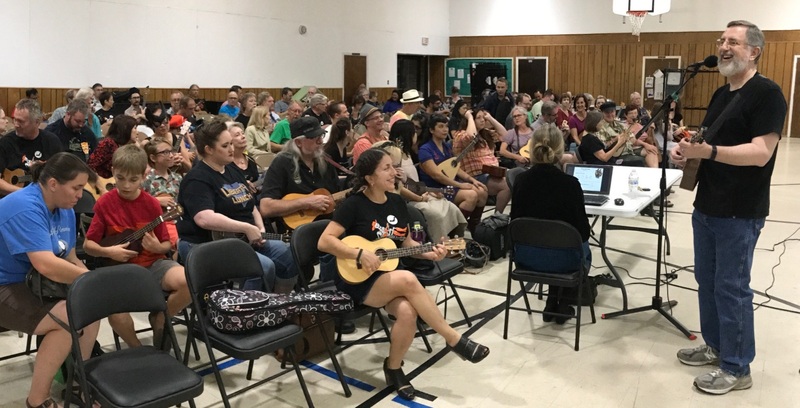 If you didn’t get a chance to join us and would like to strum those holiday tunes as well, you can download the Austin Ukulele Society’s 2017 Holiday Songbook, which contains the chords and lyrics for all of the songs below in one handy PDF booklet! 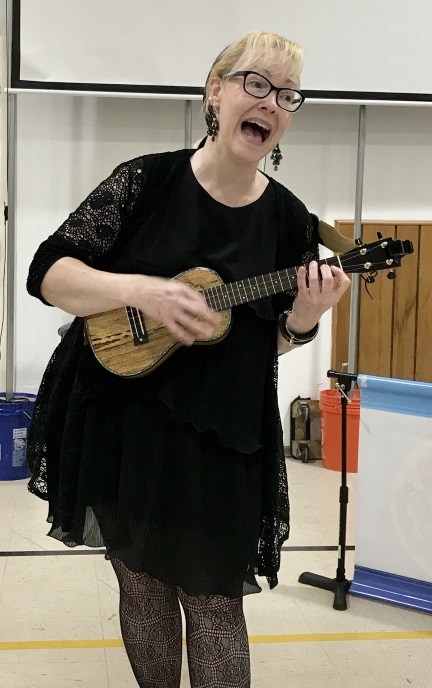 We were treated to a lovely variety of talented performers during the open mic portion of the evening, with Christmas songs, other covers and originals to boot. We are grateful that Walter indulged us by reprising “I Want a Hippopotamus for Christmas” (does anyone actually do this better than Walter?). We offer a hearty thanks to Walter, Helen, Richard H, Big Al from Ottawa, Nancy and Mandi – as we are so lucky to have you share your talent with us. We wish everyone a very healthy, happy and safe holiday season, and look forward to seeing you back in the Memorial United Methodist Church’s (MUMC) gym on Thursday, January 11th for our next regular meeting! 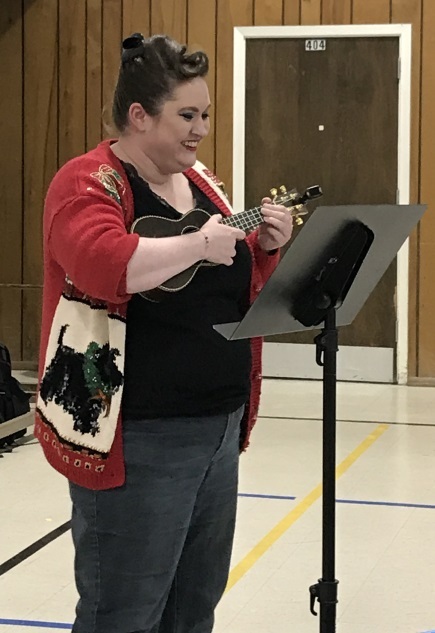 This entry was posted in AUS activities on December 16, 2017 by Austin Ukulele Society. Holiday Party: Thursday, December 14! 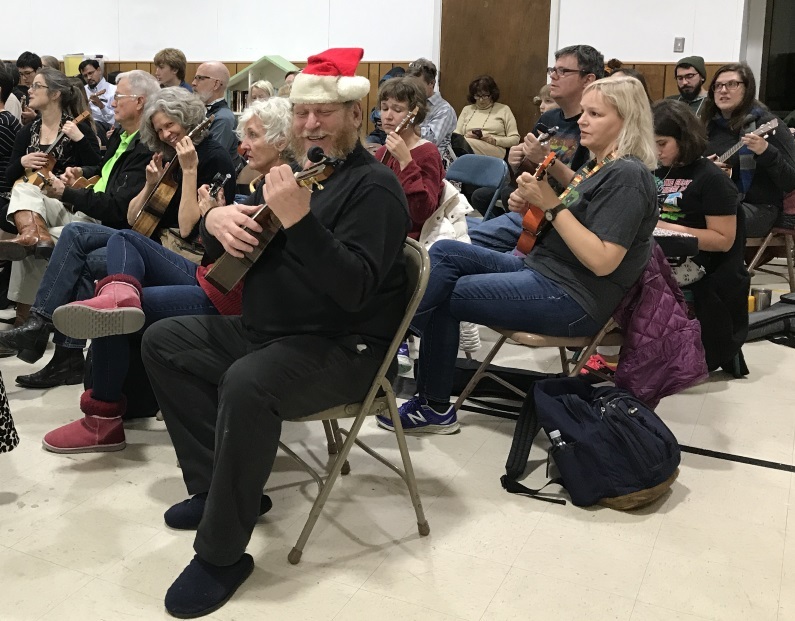 Whether you find all of the hustle and bustle of the holiday season a bit stressful or it’s your favorite time of the year, our 7th annual Austin Ukulele Society Holiday Strum-a-long and Potluck is something you don’t want to miss! 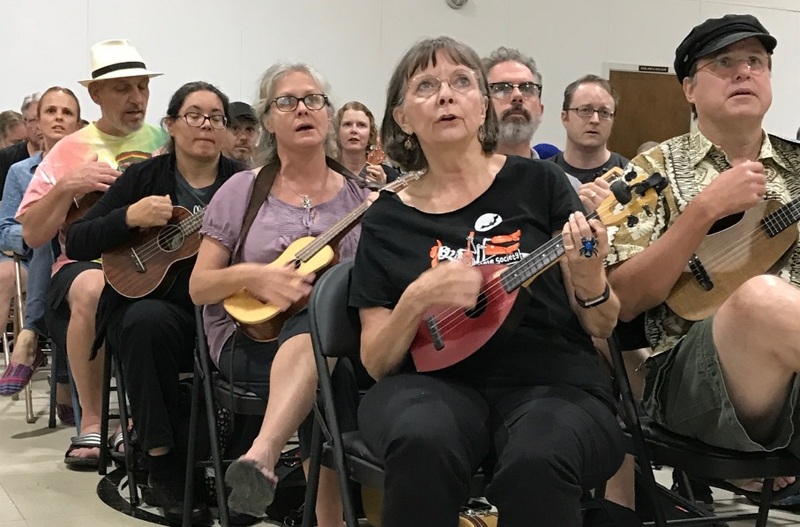 Each year, in lieu of our regular monthly meeting at Memorial United Methodist Church, we have a social event with food, drink and, of course, plenty of ukulele strumming and singing. Thursday, December 14, 2017 from 6:30 to 8:30pm, giving us a nice amount of time to mingle, nosh, and play music. 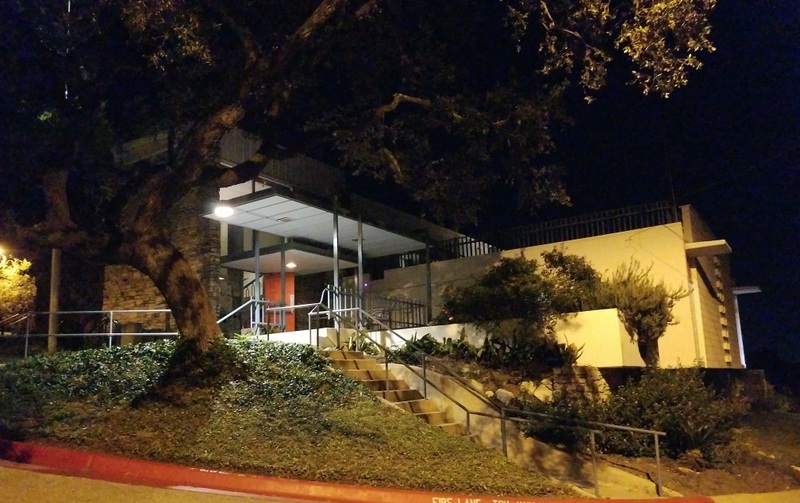 The High Road on Dawson, located at 700 Dawson Rd, Austin, TX, 78704. We’ll be in the second floor event space. Free and plentiful off-street parking! There’s plenty of space so bring along friends and family! Children are welcome! Strum-a-long and Potluck! Feel free to bring a dish to share. Any type of food, snack or dessert is welcome; just remember to take home with you any dishes you bring. Plates and utensils will be provided. There will be a full, cash bar with beer, wine, liquor, soft drinks and water available. Please note that no outside beverages of any kind may be brought in. We’ll mingle, eat, drink and play the holiday songs we’ve learned over the years. We’ll project the chord charts from our repertoire of Christmas songs from years past; feel free to get familiar with them. Download our 2017 Holiday Songbook, which contains the chords and lyrics for all of the songs below in one handy PDF booklet! We’ll also have an open mic portion of the party. Feel free to prepare a song, holiday-themed or not. Perform it yourself and/or lead the group in playing/singing along with you! As usual, we’ll have a sign up sheet available. And in case you want to get in some holiday shopping, we’ll have plenty of Austin Ukulele Society t-shirts on hand for purchase – including our beautiful brand new 2017 “Ukulele Mermaid” design, crafted by the talented Lyda Guz and printed right here in Austin! Our newest shirt will cost $20; all previous years’ shirts are $15. We accept cash or a check made out to Bob Guz or Jen Richardson. One final note about the High Road on Dawson: It was built in the 1950s and unfortunately is not ADA compliant, and our event is on the second floor. Any person with accessibility concerns can be carried in or assisted by friends/family, if possible. There are restrooms on the same floor as our event. If you have any questions at all about the party, please drop us a line and we’ll get back to you as soon as possible. 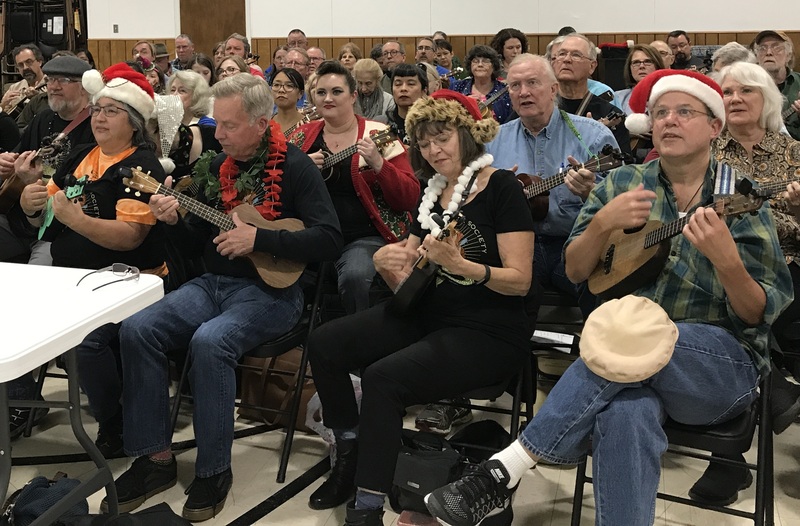 Please spread the word among your ukulele peers and remind them that we will NOT have a regular meeting at Memorial United Methodist Church (MUMC) in December. Our next meeting at MUMC will be on Thursday, January 11, 2018. 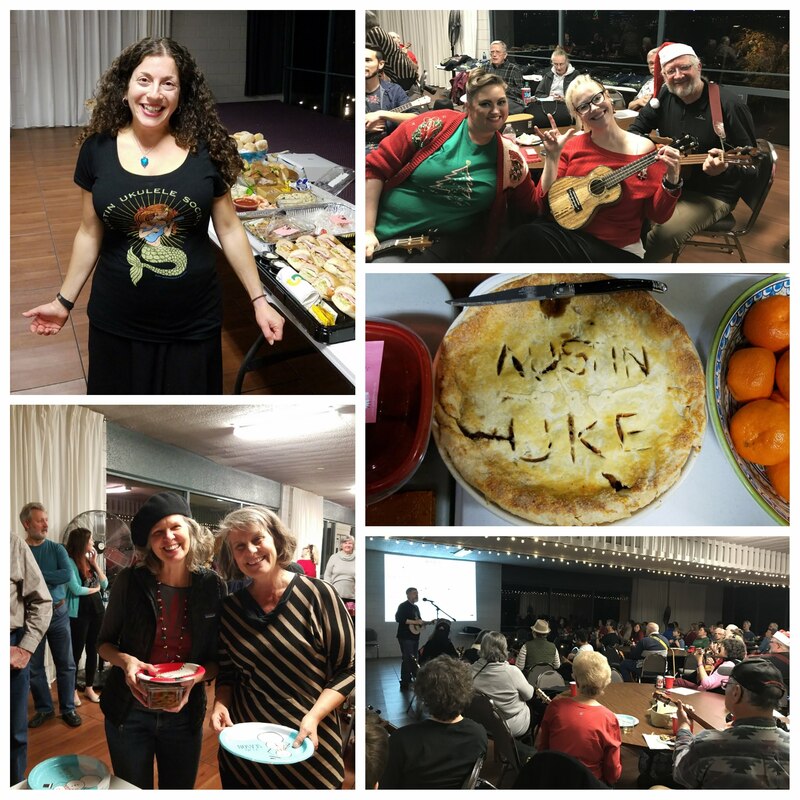 This entry was posted in AUS activities on December 3, 2017 by Austin Ukulele Society. November 9, 2017: Wagon Wheel! 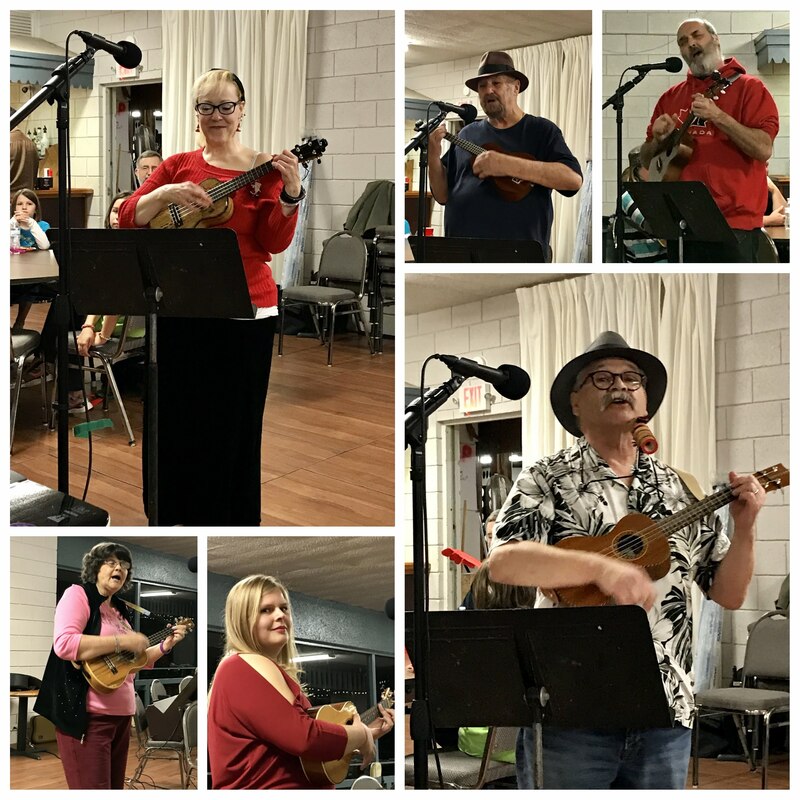 On a chilly and gray November evening, the Austin Ukulele Society created warmth and cheer for all. 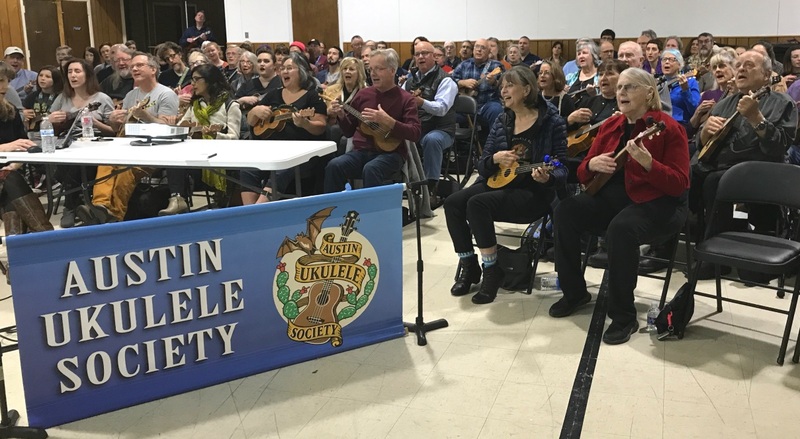 The meeting kicked off with introductions, info about upcoming local ukulele events and our warm up song, “Three Little Birds.” Next, Bob introduced our holiday medley of “Let It Snow” and “Winter Wonderland” and walked the group through helpful chord progression exercises, which made it easier to play. After rehearsing the medley a few times, we took a break and practiced one of our favorite songs and most popular videos on YouTube, “Wagon Wheel.” We hope you enjoy our recent take on it, a little more than four years since we first recorded it. Afterward, we spent more time with our holiday medley and recorded it to share in December. We are grateful to those of you who displayed your holiday spirit with Santa hats, Christmas sweaters and jewelry, and more, to make our meeting and video even more festive! 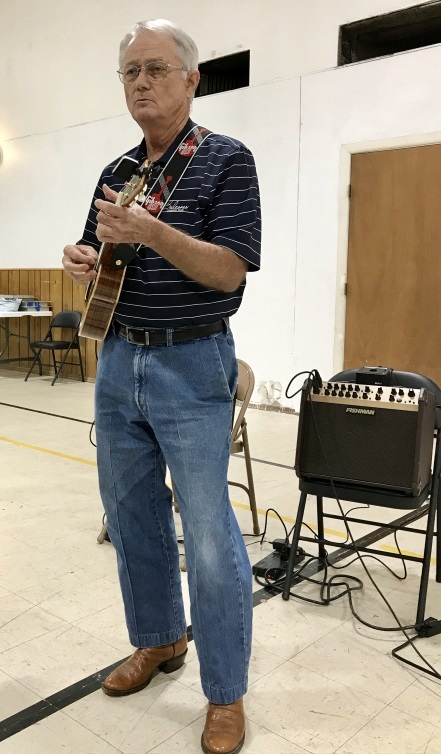 To play along with us, you can download the lyrics and chords for “Wagon Wheel” or download a copy of the presentation and instruction guide (what we project on the screen for all to follow along, including exercises and drills). 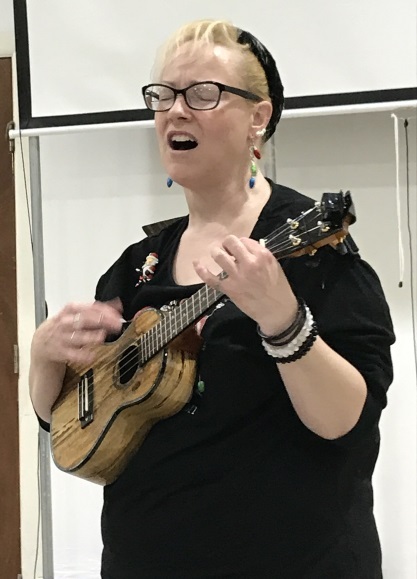 During the Open Mic Night portion of the evening, we were delighted by Sarah, Helen, John and Sho’s varied selections and originals and are always so appreciative of those who share what they’ve been working on with us. And speaking of the holidays, in case you want to get some shopping done early, we have plenty of Austin Ukulele Society t-shirts available for purchase – including our beautiful brand new 2017 “Ukulele Mermaid” design, crafted by the talented Lyda Guz and printed right here in Austin! Our newest shirt is $20; all previous years’ shirts are $15. We accept cash or a check made out to Bob Guz or Jen Richardson. Drop us a note via our Contact Us page if you would like to make an online purchase. 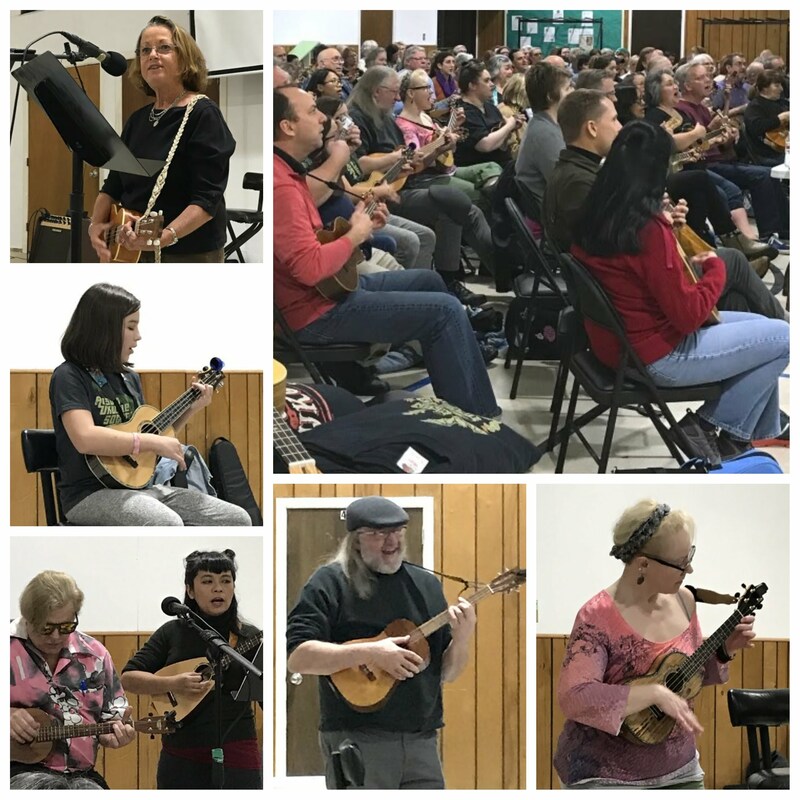 This entry was posted in AUS activities on November 12, 2017 by Austin Ukulele Society. October 12, 2017: Psycho Killer! To play along with us, you can download the lyrics and chords for “Psycho Killer” or download a copy of the presentation and instruction guide (what we project on the screen for all to follow along, including exercises and drills). 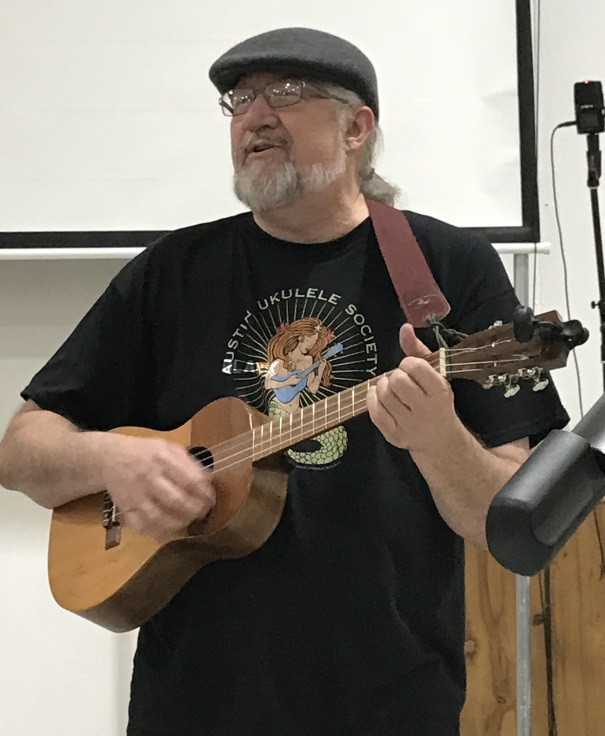 During the Open Mic Night portion of the evening, we were treated to an awesome and thrilling variety of songs – from blues with Daryl, to punk rock with Helen, to an instrumental by Roger, and jazz by Bob – along with a fantastic camping gross-out song performed by Walter. We were once again amazed by the wonderful talent shared by our members. 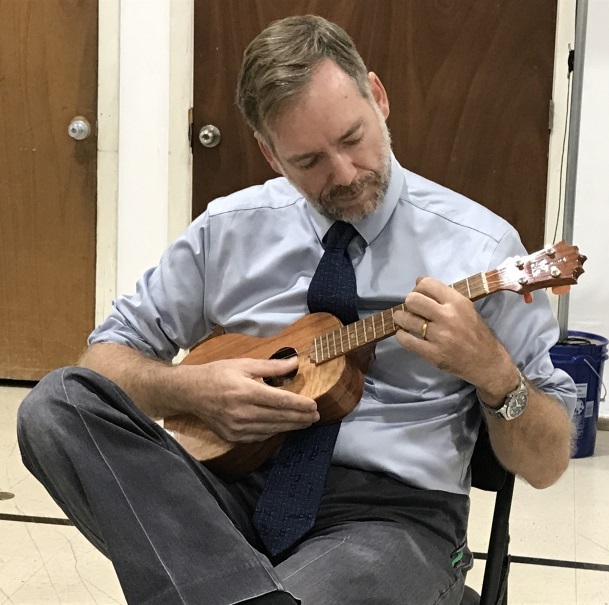 This entry was posted in AUS activities on October 15, 2017 by Austin Ukulele Society.